VIN# WBD 10702612002252. 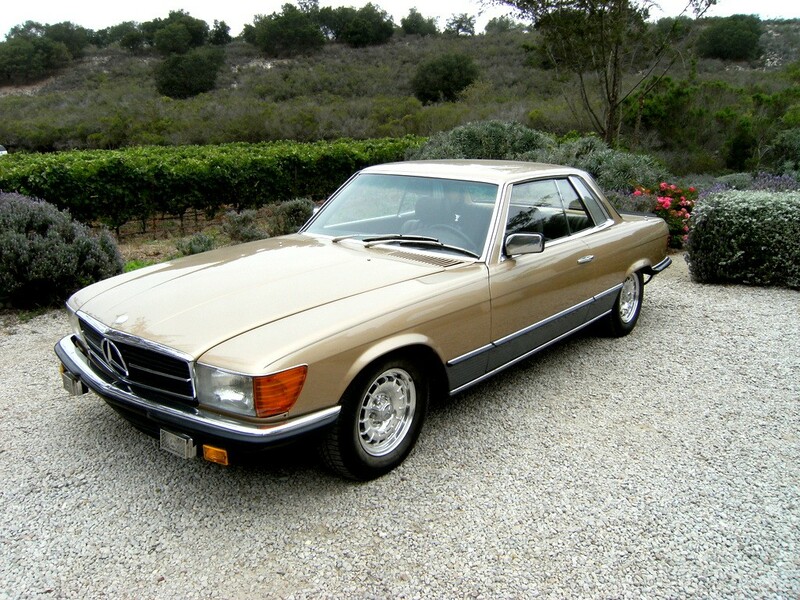 79,000 Miles, 473H Champagne Metallic, 273 Dark Brown Leather, Burl Walnut Console and Dash. All Leather Interior. Aluminum Block V-8 Engine. All Modern Amenities including air conditioning, power windows and power steering. Factory Sunroof. Factory Original Spare Tire (Unused), Original Tools and Owners books. Comprehensive Service Records. Full Ownership History. This Mercedes-Benz manufactured Homologation Special Edition was specially built in production form to qualify for FIA racing standards, meaning in order to competitively race Mercedes-Benz had to create at least 1000 production vehicles to accompany official rally cars it wanted to race competitively. The 450SLC 5.0/500SLC coupes were produced by Mercedes-Benz from 1978 to 1981 and are among the rarest post-war models. They were manufactured by Mercedes Benz to homologate (make competition race worthy) the 5 litre for road rally purposes. Some cars were competitively campaigned with factory support, but the rest of the production was sold to the European market to meet homologation guidelines. The combination of the lighter weight and higher horsepower made for a quick and competitive car that raced successfully with the introduction of the 5 litre engine in the World Rally Championship Series including First Place finishes in 1979 and 1980 at the Ivory Coast Rally. Other notable participation in competition included the Rally of Argentina, Rally of New Zealand, Acropolis Rally and Portugal Rally. The cars were given massive factory support under the leadership of Eric Waxenberger. The fact that the Managing Board of MBAG officially withdrew from world rallying in 1980 makes the 5.0 the last factory-sponsored wholly Mercedes model. The rally racing clock for Mercedes-Benz ended for good with the success of this homologated SLC special. Along with the performance enhancements and plaudits which are detailed below, this car’s comfort and daily drivability combined with every modern amenity led renowned championship drivers of the time period to use them as personal get-arounds. 1979 World Champion Driver of Ferrari Team Jody Scheckter chose this as his personal car. Jean Pierre Ganier and Patrick Depailler of the Tyrrell Formula 1 team also chose the 500 as their daily drivers. Fewer than 100 cars were imported into the United States. 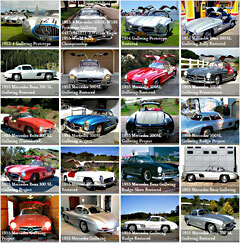 In 1999 Mercedes-Benz SLC specialist Bob Hatch of Hatch and Sons estimated that at most there might be 50 of these cars in the country good enough to interest a collector, but in the years since his statement, given the drivability of the these cars, there are certainly significantly less than that at present. The example be offered here is certainly in the upper echelon of those Mr. Hatch was speaking of due to its meticulous care over the years. This example differs from the stock 450SLC’s in several important and distinctive ways. The hood and trunk lids are made from aluminum for significant weight savings. The car weighs 3,333lbs, 220lbs less than the standard SLC. To emphasize the lengths to which MB went to upgrade the car for homologation, it even has an alloy air cleaner to add to the weight savings. The front and rear aerodynamic spoilers the factory added result in a 9 – 10 % reduction in wind resistance and a top speed which exceeds 142MPH. The 5.0 is the very first Mercedes-Benz aluminum block V-8 production motor and is lighter than the standard iron block . It produces in excess of a whopping 300 HP and 350lbs of torque…a true blacktop powerhouse in its day. The 5.0 engine features factory reworked heads with larger valves, pressure fed valve adjusters, cross-bolted main bearing caps (4 bolt mains in hot rod parlance) and many other special tweaks. The 500SLC also features the upgraded 4-speed automatic. This particular car was imported new to the USA in 1984. Philip Manuell of Indian Wells California sold the car to Abbey Silverstone of Palm Springs California in Feb. of 1991 where it was kept in a climate controlled setting along with the rest of Mr. Silverstone’s collection. The car was acquired by Scott Grundfor Co. in May of 2014.